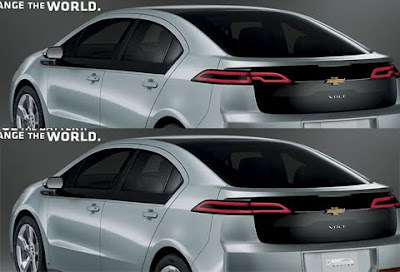 Before you try to "change the world" with your Chevy Volt how about you change the brake lights so they look like you know how to actually fit to pieces of a car together properly. The image below is the current brake lights on the Chevy Volt (top) and my photoshop of them so they line up and are WAY better looking. God this car is so damn interesting and so damn annoying almost in equal measures. This is photoshopped. I can tell by the beards, and from having seen a lot of nazis in my day.